The course length will always be approximately 3.1 miles, starting and ending in the Insane Midway, but each venue provides it own unique terrain and running experience. For the most part, we run off-pavement and on grass as much as possible. Certain venues have more grass than others, but we promise to make our course all about the inflatables! Depending on weather, one or two water stops are placed along the course to keep everyone hydrated. The event is NOT timed, so go out and enjoy the course, but if you can’t tame your competitive side and think you can blaze on through the fastest – more power to you! 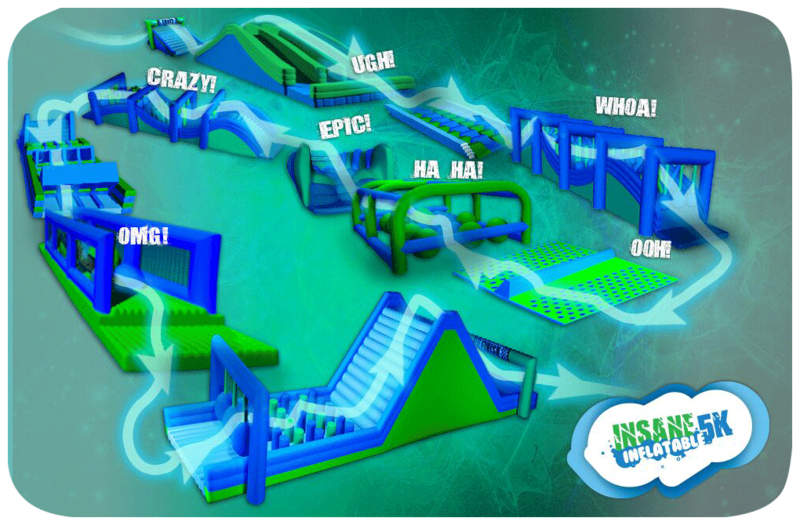 Like all good things, the Insane Inflatable 5K is more fun with family and friends. Along the course one of your friends is sure to have pulled off some ridiculously embarrassing moves that you won’t be able to let them live down. After all that’s a part of the fun! Teams are highly encouraged and 100% free to setup when you register. What are you waiting for? Wrangle your team together, come up with some #CrazyFun costumes (Costumes not required) and join us for what is sure to be one of the best days of your life. After conquering our obstacle course, the Insane Midway isn’t a bad place to kick back, grab something to eat and relive the experience with friends and family. Spectators get into the event FREE, so make sure to bring your whole crew. The Insane Midway changes from event to event, but there is a little something for everyone including food trucks, games, music and sponsor activities. While you’re there don’t forget to grab some of our awesome merchandise to help commemorate the entire experience!